I had head about the wonderful extravaganza “ Kingdom Of Dreams”, from my friends and almost all the airports of the country have its poster with the line “ delhi aake isse nahi dekha toh kya dekha”. 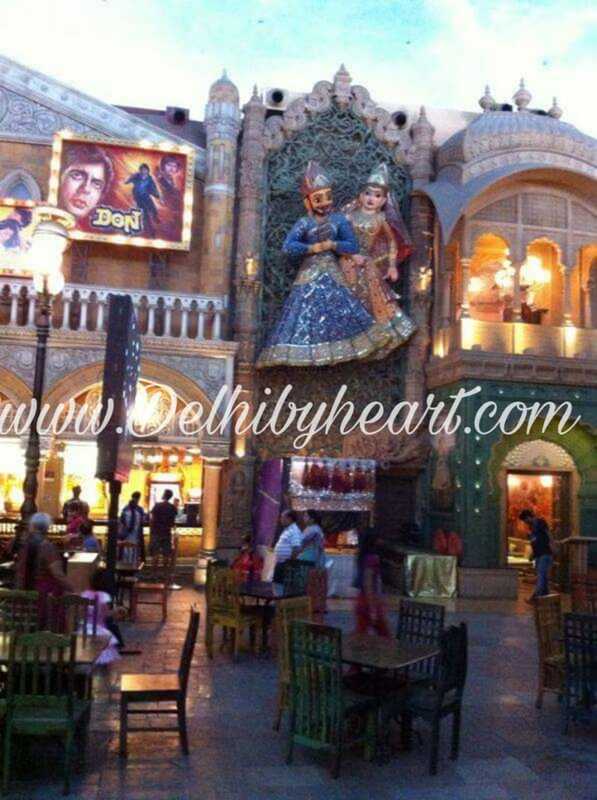 It shocked me is it that good and then we decided that we will trail and spend a day at Kingdom of dreams. 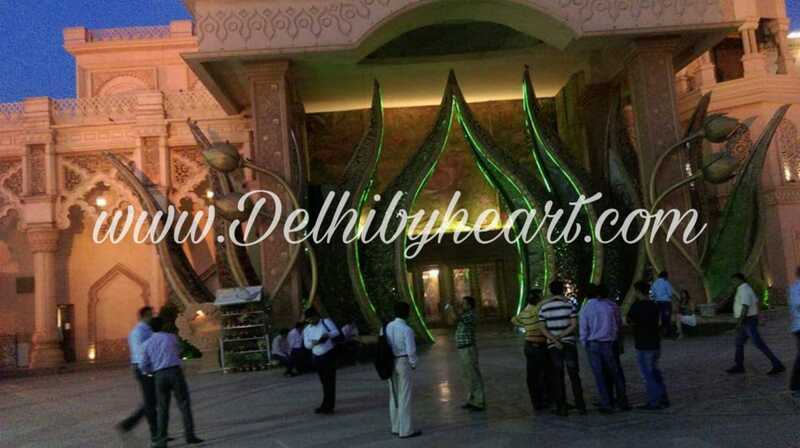 As soon as we reached the venue I was swept off my feet the entrance was so regal, it was glittering and golden. I stood at the entrance for a while to simply soak in the beauty and the mere sight of huge elephant sculptures, men in colorful clothes and the lively festive music, it all did the right thing and took us in to the world of dreams. The kingdom of dreams is a celebration of things and feelings that are larger than life. As we entered I felt if I was bestowed with four eyes it would have been better to capture the beauty of this place. From any angel or any corner or any place you put your eyes and something impossibly beautiful looking back at you. The serene Buddha sleeping or the reverse bungee jumping there is best from both the world or lets say all the world. The wall of reflecting mirrors that reflects the light in the most soft and delicate way, the view here is simply dreamy. Now the real thing that you would want to know, so food, shopping, shows, unity in diversity, no combination of 26 alphabets can truly define the fun and experience this place can offer you. As you try to get over the bejeweled entrance the first place where I wanted to be was the culture gully, here was the finest display of food from the different part of the country. A perfect treat for your taste buds. I was startled what to eat and what not to eat, again I wished I had two digestive system so as to ingest almost everything. Apart from food there was small shops with the restaurants showcasing the traditionally found trinkets and curios from the state. I was simply swept off my feet, so much to see, eat and grasp. Thus after the mouthwatering food and the beautiful and magnificent decoration with some shopping we moved towards fun activities like the face reading, palm reading and much needed foot massages. One thing that I resonated the most here was the very cool, stupendous Bollywood lounge bar that had huge movie posters and the red carpet to pose around. My elder one could recognize a few stars and was thrilled to do so. The younger was thrilled to see the false sky and it made her so cheerful. The warmth and lively attitude that the chefs and staff had left us spell bound and I could actually feel so connected. The food was of top quality and prepared in complete hygiene kitchen that will make you crave for more and more. After the scrumptious meal we headed to Nautanki mahal as the my drama queen wanted to perform on some Bollywood numbers. It is in this theatre that world acclaimed Zangoora – the Gypsy prince is performed. And let me tell you with the Indian artists and in our land it is a world class show that will give you no chance to even blink your eyes. The set, costumes, acrobats, hanging gliders, magical stunts and what not felt a blessing to have the opportunity to see the show. The show has best Bollywood numbers that will not only entertain you but make you a part of the show. The play was a sight to behold. There are three more shows that happen there but are scheduled on different days of the week. Kingdom Of Dreams is bright, colorful, delightful, musical and definitely it made my daughters, husband very very happy, thus very soon we will plan to see another show and indulge in some other cuisine. It was a fun filled and magical day. The memories created here will be cherished for ever and will help you grin even after days.